Combat, in some senses, is an exchange of information. The information may be don�t mess with me. It may be go ahead, give me everything you�ve got. It may be you are not long for this world. Such information, like the effect of a sniper�s shot, makes everyone� suddenly very attentive. Such information is never a one-way street. There is a necessary adaptation in practice. Information given can�t be restricted by pride or ideology. You may hate the other guy, but if you can steal his technique you will use it anyway. To save what pride you do have you may rename it; Jujitsu may transform into Combato, but the essence stays the same. The martial arts is in constant flux. Street fighting bows to jujitsu which is supplanted by Karate that transforms to Taekwondo which for a while changes to Ninjitsu which turns itself into Wing Chun then revives as Jujitsu to return to street fighting in the guise of MMA. It�s not as fickle as the length of hemlines but, on the other hand, it�s not as long lived either. The Chinese suffered some hard lessons in the latter half of the 19th century: Manchu conquerors, Western intervention, European diplomacy, Japanese Manifest Destiny, booming population, the biggest civil war on the planet, the governmental attempt to discredit martial arts, the outlawing of the arts, the rise of secret societies, a rash of famines, Western scientific and medical supremacy, missionary pressure. They also encountered Western fighting skills. Here are three text examples of the Chinese adopting Western fighting systems. 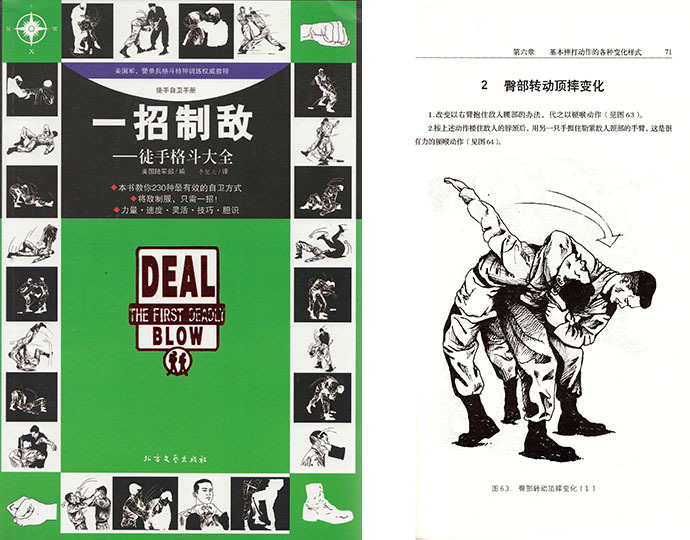 2.���� A book written by a Chinese on �American� fighting style by� someone who obviously dedicated himself to doing it right. It even has�gasp!�weight-lifting photos. There is even a small�very small�contingent of people who believe that Kung Fu started in and around Greece. It is said that Alexander the Great may have brought the Greek methods such as pankration 0n his route of conquest. It was then taken up by the Indians who transported it to China and the Shaolin Temple. Strange as it seems we have statues, even including images of the Buddha, influenced by Greek manners and resemblances. There are ancient Greek amphora decorated with techniques exactly like Kung Fu. There is even “Menander“, a dialogue recorded between a king of Greek ancestry and a Buddhist teacher. Of course this is proably just simultaneous invention, but this section is called “fun stuff,” and such speculation can indeed be fun. The point is that martial arts have always been thus: taking whatever is needed then pretending to toss the rest (at least until it is needed again.) Whether in a cage, on a battlefied or during an international negotiation, we choose what we need. I think of this as selective martial arts; other than that they have already and always been mixed. P.S. “Western Wrestling” is in Chinese. If you are interested, we have a few (about 5) extra copies of Book #1 and will send you a copy for FREE if you are among the first five people to request it. Posted November 26, 2013 by Plum Staff. Comments and trackbacks are open. Follow the comments feed. Tagged with: Boxing, Combato, jiujitsu, Judo, jujitsu, personal combat, shuai jiao, Sumo, wrestling.